On Tuesday May 8 we had the privilege of welcoming local artist Juliana “Jewels” Smith to the writing lab. Jewels is the author of (H)aftrocentric: the Comic. This is a comic about a self-proclaimed radical Black feminist, Naima Peppers, and follows her as she personally deals with issues such as gentrification, white supremacy, and apathy. As a student, Jewels studied Sociology at UC Riverside, and continued on to receive an M.A. in Ethnic Studies at UC San Diego. She is currently traveling to different schools, sharing with others her passion for using comics as a tool for education. 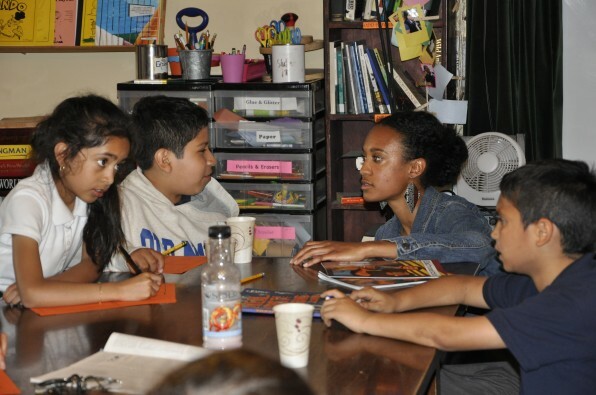 While at our writing lab, she led students in an activity where they developed their own super-hero characters. Students were thrilled to be able to create characters of their own imaginings the best part was giving them the chance to share their creative ideas with the whole group.